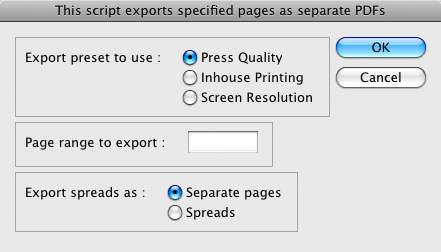 this is the fourth in a series of lessons on exporting pdfs using applescript. lessons 08 and 09 showed how to export all open InDesign files at once. 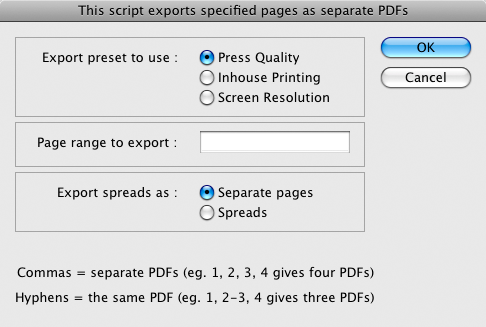 this next script will create separate pdfs for different page ranges within the one document. this is really handy in a publishing environment where you often export just portions of a file, rather than the whole document. "1, 2-3, 14 -15, 26 - 27,   38,   49  "
well, that’s it for now. we’ll complete this script in the next lesson. the finished script will add the page ranges to a truncated version of the filename — so exporting from “54321 ThisFile Name.indd” gives a pdf named, for example, “54321 ThisFile_2-3.pdf”. you’ll learn how flexible that process is — so you can tailor the renaming to your specific needs. This entry was posted in applescript, indesign, scripting lesson and tagged adobe, applescript, automation, dialog, export, how to, InDesign, pdf, tutorial by macgrunt. Bookmark the permalink. Any idea how to space a radio button group in 2 columns? i.e. There’s no way to do this with pure Applescript. I expect it would be achievable with something like AppleScriptObjC, but I have no experience at all with the more advanced scripting possibilities.